Here in the calendar department at Calendar Lady Promotions we have a lovely line of 2019 CD calendars which can be personalised with your company logo and details. They are a pop up calendar that sits on your desk top and you swap cards every month. So have your business details and logo printed onto our CD calendars today, giving lasting exposure throughout 2019. 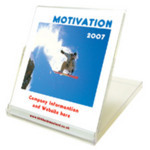 CD calendars with company logo click here. To find out more about our CD calendars with company logo click here and fill in the contact form and we'll get right back to you. You can personalise your CD calendars with company logo and contact details which are printed across the bottom of each page.